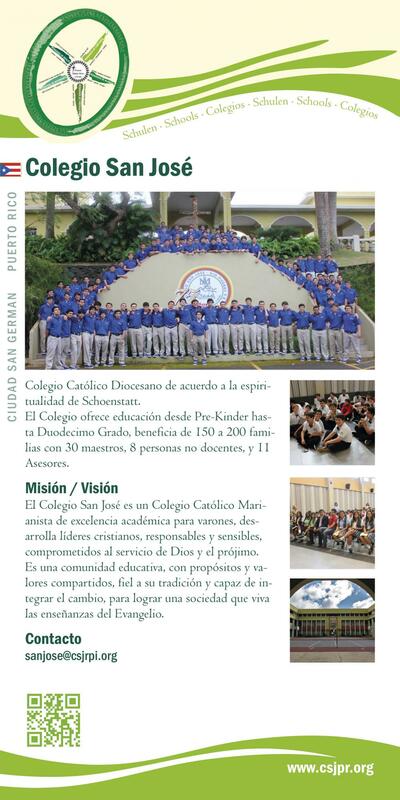 Catholic school in the diocese based on Schoenstatt‘s spirit and spirituality. The school takes children from pre-kindergarten to the 12th year; 150-200 families belong to it; there are 30 teachers, 8 employees, and 11 school counsellors. St Joseph‘s College is a Catholic boys‘ school run by the Mari- anist Society. It aims at academic excellence and leads students to University entrance level. The goal is to educate reliable and responsible Christian leaders. St Joseph‘s College is an educational community with common goals and values true to its tradition. It is able to integrate ch- anges in order to help build up a society in which the teaching of the Gospel is alive.